This week my new book was published. It’s non-fiction for ages 4+, and it came about because of how I felt. I heard and read examples of the world becoming a more intolerant closed-minded place, and I thought: “What can I do?”. I’m a children’s writer, mainly of non-fiction and work for under-12s, so what really could I do? The answer, for me, was to do what I knew how to do best. So I wrote a non-fiction book. 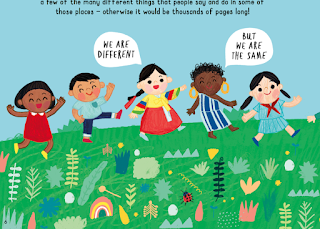 I hoped that it would help children become aware of other cultures from an early age – the interesting differences but also the profound similarities between the lives of children all across the world. Perhaps it might influence them to value others, wherever they lived. Nosy Crow knew it was the right time for the book and paired me with the very talented artist Harriet Lynas. 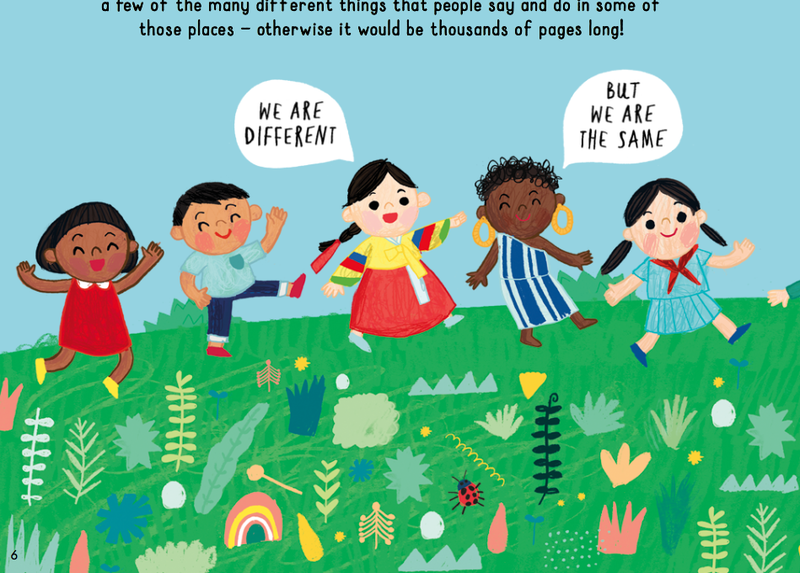 The new book, written as a celebration of children's lives everywhere. Children’s non-fiction is having a moment at last. Investment is going in to texts to create beautiful gift objects. Thank goodness for that. Non-fiction authors are being led blinking into the light - offered proper royalty deals after decades of being told ‘flat fees only, or you get no chance to work'. This is right and proper. Children's non-fiction is important and popular with many children. Why wouldn't it be? Who has propagated the idea that it is a lesser thing for children to read and why? That's a complex, not to say incendiary, question, perhaps best left for panel discussions. Luckily it's a fading view (and luckily I'm not on such a panel because I can get a teeny bit heated about kids' reading being censored). So how should we as authors handle this new situation? Here’s my own thought. We non-fiction authors should not be discouraged by our past experiences (I know all about them, believe me). We can put our feelings into our work. By thinking hard about how we feel and what we really think we can offer children, we can turn those feelings and that empathy with kids into great books. That must sound odd to the novelists out there, but non-fiction writers have not been given the chance to earn a living this way until now. Well, here it is at last, because we’ve had trailblazers such as Nicola Davies and William Grill having success with work they are passionate about, and a lot of wonderful US authors adding to the mix across the Atlantic. Negative assumptions about non-fiction being a lesser form are at last being challenged. Let’s take the opportunity whenever we can to write non-fiction with heart and passion. Yes, we will still have 'flat fee or no work' offers and we have to keep making a living (I know I do), but we also have the exciting opportunity to let our talent fly and make the very best non-fiction that kids deserve. Welcome to Our World is illustrated by Harriet Lynas and published by Nosy Crow. Issues such as those you raise will be on the agenda. Do attend and fly the flag for children's nonfiction. Very well said, Moira. I write mostly for adults these days, but it is good if books like yours encourage engaged and enthusiastic young readers. These readers are the future. Completely agree. Your new book looks wonderful too - congratulations to you and Harriet Lynas. Sharing your post. Very well said, Moira, and congratulations on such a well-timed book! Excellent blog. I hope your book gets the reviews it deserves and is shelved prominently on bookshop shelves. I hope teachers notice it and share news of it. Keep shouting! Looks a brilliant read. Hope it does really well for you, Moira.